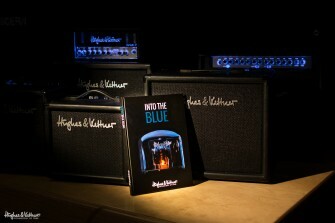 To celebrate 30 years of Hughes & Kettner amps, we’ve written a tell-all company biography – Into The Blue: A Brief History Of The Technology Of Tone – and you can buy it on Amazon right now! Our custom shop amp builder Uwe Sicks wrote Into The Blue over two years, and it provides a lovingly detailed history of a small family-run guitar amp dream that has gone on to become a reality on stages, in practice rooms and at studios across the world. At more than 200 pages long, and packed with hundreds of accompanying pictures – many of which have never been publically released before – Into The Blue pulls no punches in documenting the ups and downs of 30 years in the tube amp industry, from the early days of building speaker cabinets in a garage in Saarland to the modern-day global success of household names like the TubeMeister, GrandMeister and TriAmp ranges. It’s full of great interviews, information and rockstars too, so if you love guitars, music and rock and roll, it’s a must-read!